5 Movies Like War for the Planet of the Apes That Prove We Don’t Give Animals Enough Credit! Looking for more movies like War for the Planet of the Apes that prove we just don’t give animals enough credit? Check out these 5 flicks that will make you look at monkeys in a whole new way! War for the Planet of the Apes is an upcoming science fiction movie that is the sequel to the 2014 movie Dawn of the Planet of the Apes. The movie is set to hit theaters on July 14, 2017, starring Andy Serkis, Steve Zahn, Terry Notary and Woody Harrelson. It continues the story of the apes uprising against humanity. Here are some movies like War for the Planet of the Apes that will really make you think twice about monkeys! Congo is a 1995 action adventure movie that is loosely based on the 1980 book of the same name by Michael Crichton. After an African Congo trip, by employees of TraviCom goes wrong, a team, including Karen Ross, TraviCom’s electronics expert; Dr. Peter Elliott, a primatologist; Richard, Dr. Elliott’s assistant; Herkemer Homolko, a Romanian philanthropist and Captain Munro Kelly, an expert mercenary. Congo stars Laura Linney as Karen, Dylan Walsh as Peter, Grant Heslov as Richard, Tim Curry as Herkemer and Ernie Hudson as Munro. Instinct is a 1999 psychological thriller movie that is loosely based on the 1992 book, Ishmael, by Daniel Quinn. Ethan Powell, a famed anthropologist, who made is home in the jungle living among the gorillas, is sent to prison for murdering several park rangers. Theo Caulder, a young psychiatrist, is tasked with trying to find out why Powell committed the murders. Instinct stars Anthony Hopkins as Ethan and Cuba Gooding Jr. as Theo. Planet of the Apes is a 2001 sci-fi movie that is the 6th movie in the Planet of the Apes film series and is loosely based on the 1963 book of the same name by Pierre Boulle and the 1968 movie of the same name. Captain Leo Davidson, an Air Force astronaut, crashes his plane on a strange island, whose residents include intelligent, enslaved apes that can talk. Planet of the Apes stars Mark Wahlberg as Leo. King Kong is a 2005 epic monster adventure movie that is a remake of the 1933 movie of the same name. A movie production crew, including screenwriter, Jack Driscoll; movie director, Carl Denham and actress, Ann Darrow, heads to the mysterious Skull Island for their filming location. On the island, they come face to face with a legendary yet angry gorilla, Kong, who kidnaps Darrow, forcing the crew to fight to save her. King Kong stars Jack Black as Carl, Adrien Brody as Jack, Naomi Watts as Ann and Andy Serkis as Kong. Kong: Skull Island is a 2017 action adventure monster movie that is a reboot of the King Kong film franchise. It is also the 2nd movie, in a series of 4, in the MonsterVerse film franchise from Legendary Entertainment. The other 3 are: Godzilla in 2014, Godzilla: King of the Monsters due in theaters on March 22, 2019 and Godzilla vs. Kong due in theaters on May 22, 2020. A team of scientists, including James Conrad, a captain in the British Special Air Service; Preston Packard, a Lieutenant in the U.S. Army; Mason Weaver, a photojournalist and William Randa, a top official in the Monarch, a secret scientific organization, journey to an unknown island in the Pacific, right into the home of the legendary giant, Kong. Kong: Skull Island stars Tom Hiddleston as James, Samuel L. Jackson as Preston, Brie Larson as Mason and John Goodman as William. If these movies like War for the Planet of the Apes don’t make you think “wow, we really should give monkeys more credit,” then I don’t know what will! Hmmm, maybe Outbreak? Now THAT movie freaked me out! The monkey didn’t play a starring role in it but without him, no one would have gotten sick! 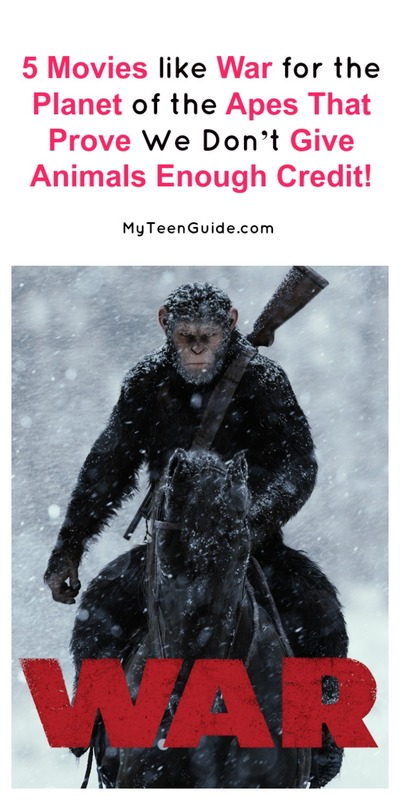 Do you have any favorite movies like War for the Planet of the Apes? Share below!